In an ever-blending world of monotonous small SUVs that want to show you how car-like they truly are, Ford’s EcoSport still has a tough off-roader look, which, thanks in no small part to the external spare, looks like an angry puppy with a backpack. However, the EcoSport only sells in the double figures (92 in June 2018-VFACTS), while RIVALS Hyundai Kona, Mazda CX-3 and Honda HR-V routinely sell over 1000 per month. We think this might have something to do with the fact the EcoSport is smaller than most of its rivals and the bad reputation of the PowerShift transmission from the old model. That is no longer an issue with a completely new six-speed automatic gearbox, plus a raft of styling revisions, inside and out and new standard equipment including Ford’s acclaimed SYNC3 system. How was our time with the EcoSport Trend? Read on to find out. This is either the car’s Achilles’ heel or its strong suit, depending on where you stand. At 4325mm long, 2057mm wide (including mirrors), 1664mm tall and on a wheelbase of 2519mm, it is one of the smaller cars in its class, but once inside, you find the EcoSport really does make the most of its space, with decent space for all outboard passengers, even those over the six foot mark. There are handy storage features such as the drawer under the front passenger seat, cupholders and split-fold rear seats. The centre console bin is a bit shallow and cheap-feeling, however. Bootspace is 743 litres with the seats up or 1178 when they’re folded. Accessing that boot can be a pain, thanks to the side-opening tailgate that opens on the wrong side for right-hand drive markets. The spare tyre on the back might give the EcoSport some visual attitude, but it does make it heavier to close too. Ford deemed the cost to re-engineer the car with an upward-hinged bootlid to be too much. Apparently a new tailgate without the spare is on its way. Towing capacity is 900kg with brakes or 750kg without them. Ground clearance of 209mm might imply off-road ability, but think again, as the EcoSport is a front-wheel drive only proposition. Here is one area where the 2018 EcoSport has made a huge leap forward. The 8.0-inch infotainment screen on our Trend model (6.5-inches on Ambiente) felt truly modern, with a crisp, floating design, superb graphics with a quick refresh rate and excellent, distraction-free functionality. 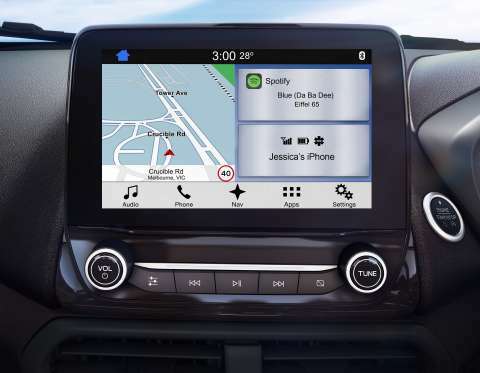 We think Ford’s voice command system is one of the best in the industry, too with control over a huge range of functions and the ability to understand many different voices and accents. The instrument cluster display is also visually alluring, with digital speedometer, many trip functions and the analog dials very easy to read as well. Stereo performance is surprisngly excellent with a little subwoofer situated in the centre of the dashboard. The BL series EcoSport is the first model to be introduced to the United States, and features the latest design language and a number of refinements over the old model. The new interior shares some commonality with the newest Focus and Fiesta models, but there are still some hard plastic elements of its predecessor that haunt the cabin. Overall, the quality of touch points such as the steering wheel, dash and doors are high-quality. Ford’s 1.0-litre Ecoboost three-cylinder engine is a beauty, having won many engine awards since its inception. The Blue Oval has crowed about the fact the short block can fit in on-board airport luggage, such is its compact size. The tiny turbo churns out 92kW at 6000rpm and 170Nm at 1500-4500rpm. In the 1368kg Trend, it is a smooth performer, with handy low-down torque, if not exactly a firecracker up high. 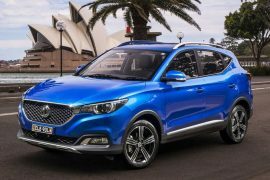 Merficully, it doesn’t have any of the nasty vibrations that afflict some three-cylinder rivals such as the MG ZS. 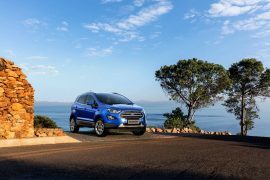 A new engine is available in the base model EcoSport Ambiente- Ford’s new ‘Dragon’ 1.5-litre three-cylinder, but this one is naturally aspirated and develops 90kW and 150Nm at 4500rpm. As we’ve discussed in another feature, the Fiesta ST’s 147kW, 290Nm engine in this thing would be an absolute cracker! Onto one crucial area that hurt the old EcoSport badly: transmission. Ford has gone completely back to the drawing board for this one, so anyone concerned about this needn’t worry. 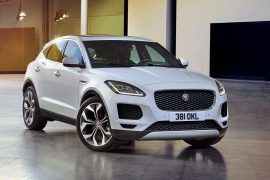 Instead of the PowerShift dry-clutch gearbox that has given them so much grief and litigation, a new six-speed automatic is the sole gearbox across the range –manual is no longer available. It shifts smoothly and pairs very well to the EcoBoost three-cylinder engine, with no hunting, hesitation or histrionics whatsoever. A very welcome leap in the right direction. Still, given the sporting potential of the car, we can’t help but lament the lack of a six-speed manual like the European ST-Line version. The EcoSport’s Fiesta DNA helps it truly shine in this arena. Instead of cumbersome, ponderous, rolly-polly handling that is class standard, it is nimble, darty and sniffs out corners like a hot hatch. The 205mm ground clearance imbues the EcoSport with a pleasingly high driving position, but doesn’t seem to impact its handling ability. Then there’s the steering. The thick-rimmed leather wheel is a true delight to hold and just the right size. It has a consistent weighting from centre to lock, manages to combine just the right amount of feedback and substantive feel, while remaining light in parking situations and perfectly tuned to the car’s size. A sound basis for a sports model then, and a stark contrast to the worst-in-class Holden Trax, which we found geared too quickly for its size and susceptible to kickback. The Indian-made EcoSport is not built to Rolls-Royce standards in terms of its ability to waft around silently, but we didn’t find any real complains, maybe a hint of wind and tyre noise, but no worse than class average in this department and only at highway speeds. Damping, bump absorption and noise suppression is top-notch the rest of the time. Combined fuel consumption for the EcoSport Trend as tested is rated at 6.7L/100km, with 5.6L/100km extra urban and 8.7L/100km urban. Our best of 7.8L/100km comes with the caveat of several hills, stop-start situations and a little bit of a hard work too. The Ambiente, for the record, is rated at 6.9L/100km- probably attributable to its higher peak torque requiring more revs to get it going from a standing start. A 52-litre fuel tank gives it an impressive range between fills. Servicing costs are surprisingly well-contained, with 15,000km intervals. The first few services will cost between $230 and $260, until 45,000km where it will set you back $465 as it includes more major service items. It then reverts back to $230/$260 until 120,000kms where another major service is due. 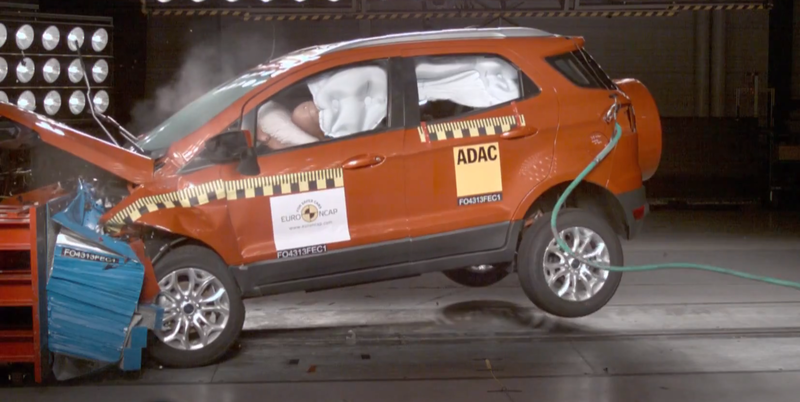 Full marks here for Ford’s baby SUV, with a five star ANCAP rating, however it does miss out on Autonomous Emergency Braking (AEB), which is important to some, but not others. Still, it achieved that five star rating with a combination of active and passive safety features, meaning it is friendly to pedestrians, drivers, passengers and children alike. While it does have some negatives, such as the lack of AEB and a few scratchy surfaces in the interior, a lot of the interior materials, the infotainment screen and steering wheel are top-notch and it has quite decent levels of standard equipment. The $22,790 (before on-road costs) Ambiente does have hubcaps and a smaller 6.5-inch infotainment screen, so it’s worth making the leap to the $24,490 Trend variant tested here. A top-of-the-range Titanium is available from $28,990 with leather and sunroof, to name a few extras. We are confident that Ford wishes the EcoSport performed much better than it does, sales-wise. The things that blunt its appeal to some – smaller size, wrong-opening tailgate with heavy spare, lack of diesel or all-wheel drive also give it a unique character and charm that no other small SUV possesses. If you can look past those flaws, the EcoSport is great to live with in every other way, with outstanding steering, handling, smoothness, tractibility and surprising levels of practicality as well as low running costs. It definitely deserves to be doing much better than it is sales-wise, especially now that Ford has fixed its biggest failing- the gearbox.